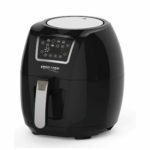 Ergo Chef My Fryer Giveaway!! Happy July! $50 Your Way Giveaway!! Ergo Chef 6 Piece Set with Myron Mixon Pitmaster Grill Tool Giveaway! !